These supplemental resources can only be used with the Reading by Design program. These resources cannot be used with the Dyslexia Intervention Program. 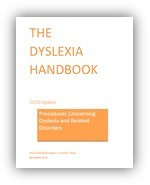 The New Dyslexia Handbook is Now Available! To order your printed copy please download and submit this pdf form.